Presenting a streamlined approach for IT. In the course of the digital transformation, data is becoming an important company asset. Protecting this is turning into a constantly growing challenge. That is why most companies have vehemently invested in the latest IT security technology in recent years. Due to the increasingly complex IT landscapes, however, companies have to prioritize their activities. They may have to focus their efforts on the most critical applications and data, for example. Enterprise Architecture (EA) management offers the perfect framework to anchor IT security in a company. 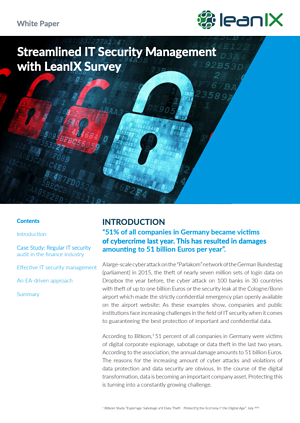 In this white paper, we are presenting a streamlined approach for IT security management with the aid of the LeanIX Survey Workflow.